Bank stocks 101 in five easy steps. Bank stocks are a tough nut to crack. Their balance sheets are huge, their income statements look funny, and good luck figuring out their cash flow. But don't worry. Help is finally here. Here is an easy five-point checklist that will guide you through the analysis of any bank stock, start to finish. Banks are unique for two important reasons. First, banks sell a product -- loans -- that they must get back over time. If loans aren't repaid, banks will quickly accumulate losses. Second, banks are highly leveraged. In today's environment, most banks' total assets are about 10 times more than their equity base. That means if just 10% of a bank's loans aren't repaid, those losses will destroy 100% of the bank's equity. Taken together, these factors mean that risk management should always be the first consideration an investor reviews for any bank stock. The challenge is that financial statements show only problem areas that are already known, not the problems about to arise tomorrow. To solve this challenge, analyze how the bank performed through the past few economic cycles -- both booms and busts. A bank that outperforms during boom years will oftentimes give all those gains back plus some when the economy slows down. The best banks do well consistently, showing discipline during boom years and taking advantage of opportunities during down years. A bank that forgets this fundamental is a bank that will find itself with serious problems in the future. After risk management comes earnings power. Banks must generate revenue sufficient to cover their expenses and provide an acceptable return on investor capital. If returns fall short, investors will move their capital to other investments with better earnings, sinking the bank's stock. We don't want that. The easiest way to assess earnings is with the return-on-equity metric. In today's interest-rate environment, the best banks will produce returns on equity above 10%. If a bank's earnings are so high they seem too good to be true, then circle back to the first item and double-check that the bank isn't taking on excess risks to boost returns. That could mean excess leverage on the balance sheet or booking loans with higher yields and higher risk profiles. 3: How is the economy doing where these banks do business? Banks are intimately related to the communities in which they serve. An economy that's producing high-paying jobs, generating growth for local businesses, and attracting investor capital is the perfect environment for a bank to operate. With the exception of the Wall Street investment banks, the bread and butter of the banking business is accepting deposits from customers, lending that money out as loans, and profiting from the spread in interest rates paid between the two. If the local community is booming, that means more deposits, more demand for loans, and more bank profits. Local economic factors become less important as banks get larger. National banks such as Bank of America (NYSE:BAC) or Wells Fargo (NYSE:WFC) have interests in virtually every community across the country. Their geographical risk is fully diversified. A community bank is, of course, highly concentrated in a small area and therefore more affected by local events. Regional banks, such as the mid-Atlantic and north-eastern focused M&T Bank (NYSE:MTB), fall somewhere in the middle. 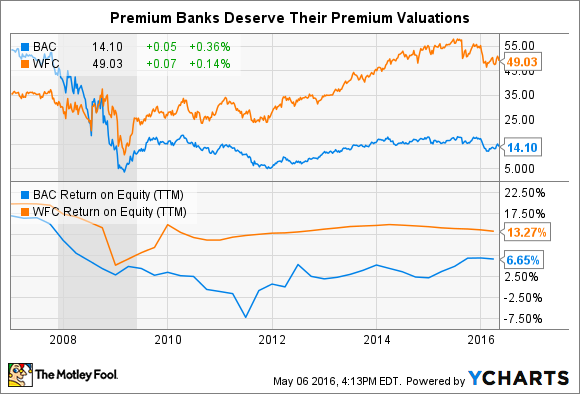 4: Does the bank's valuation make sense? Generally, a bank with a price-to-book value ratio below 1.0 is considered cheap, and a bank with a price-to-book value ratio above 2.0 is considered expensive. Those ranges vary with time and economic conditions, but the price-to-book value ratio remains the easiest metric to assess a bank's valuation. That said, in a business built on risk, it's usually worth it to pay a little bit extra and buy a top-performing bank. There's a reason, for example, that Wells Fargo trades at 1.4 times book value, well above Bank of America's 0.61 ratio. That reason, as you probably guessed, is found in the first two points on this checklist. Wells Fargo has much better earnings than B of A and has performed considerably better through past economic cycles. On a trailing-12-month basis, Wells Fargo's return on equity is currently double the 6.65% from Bank of America. Since Dec. 31, 2006, just before the financial crisis struck the economy, Wells Fargo's stock is up just over 37%, slightly worse than the S&P 500. Bank of America, on the other hand, is down 74% over the same period. In the world of bank stocks, you get what you pay for, so make sure you're buying quality. Finally, assess how the bank has treated its shareholders in the past. Start with its dividend, which can sometimes be considerable, but focus more of your attention on a more sinister force: dilution. 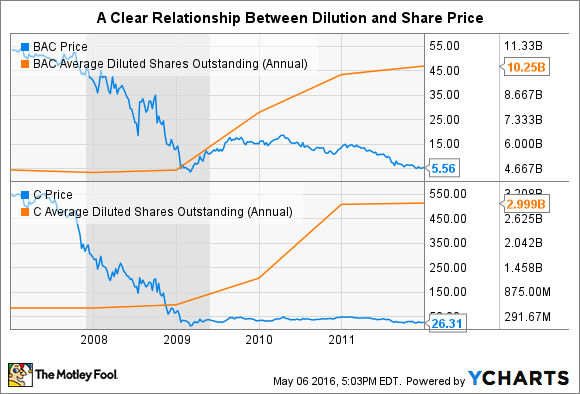 Shareholder dilution can come quickly and publicly, or slowly and under the radar. When a bank finds itself in need of capital because of regulator demands or during a genuine economic crisis, some banks will turn to issuing huge amounts of new shares, crushing existing shareholders. Citigroup and Bank of America are two notable examples, both diluting shareholders significantly to raise new capital during the financial crisis. If you owned Citi or B of A during this period, you may want to scroll past this chart. "M&T has long prided itself on a patient approach to mergers and acquisitions, entering into partnerships that made sense and which were additive to shareholder value. We are not motivated by growth for growth's sake, and even while cognizant of gaps that may exist in our geographic footprint, prudence has always dictated that we wait for the right opportunities for expansion." Banks can be an intimidating business to analyze because the operations, financials, and jargon are so different from other industries. However, now that you're equipped with this checklist, you have everything you need to analyze nearly any bank stock. Start with its risk profile, move on to earnings and growth, and conclude with valuation and shareholder friendliness. It really is just that simple.